Gutter Guard in Sacramento – Call For Your Estimate Today! If you are interested in keeping unwanted debris out of your gutter system. Than call Monster's Gutter today for an estimate on Gutter Guard Installation Sacramento today. Covers and hoods are highly effective in keeping leaves and other debris out of your system and clogging up your downspouts. There are many different types of rain gutter guards, each of which functions a little differently. Investing in gutter guard Sacramento can be a great idea, mostly because they will eventually pay for themselves. When you have gutter guards installed it will reduce the number of visits needed for professional gutter cleanings. Depending on how much debris can get into your gutters, cleaning sometimes needs to be done 2 times a year. It is important to note that gutter guard installation Sacramento doesn't mean that things can't still go wrong with your gutter system. To keep your rain gutters completely clear of all debris throughout the year you will still need to have them cleaned once in a while. So it is recommended to still have a company like Monster's Gutter come out and inspect your gutter system periodically. Gutter Guard Installation Sacramento is the complete install of gutter guards to our Sacramento residents. Gutter Guards comes in all different material & often produce different results. We refuse to install gutter guard that presents little to no advantages to the homeowner. Often times people purchase the cheapest gutter guards which have little to no benefit. Only high-quality gutter guard Sacramento provides residents benefit between the trees & the wind you need a guard that will keep debris out of the gutter. Our company has found time after time the cheap gutter guard only turns out as a hindrance when you need to clean the gutter system. When our clients purchase gutter guard through us we provide the premium gutter guard for our clients. After installing our clients know their gutters will remain clean & clog for a few years. Which is the benefit they purchase with their gutter guard system? Sacramento is the city of trees and often provides it's residents difficulty keeping their gutter systems clean. Very few homes in Sacramento get the benefit of rarely needing to clean the gutters. So it is very important when picking the gutter guards to invest in a higher quality guard for your home. When installing gutter guard Sacramento California it is very important to install properly otherwise you could damage the gutter system or mute the purpose of the gutter guard Sacramento. So all residents should be aware that not all gutter guards provide the same benefits. When looking for the best system for you consider what you are trying to accomplish prevent cleaning the gutters. So when investing in a gutter guard system it's best to invest in a guard for the gutters that will keep your gutters clean for years. You don't want the wind to blow your gutter guards away & cause you to have issues. Our clients have given us the highest ratings for the quality of service we provide during gutter guard installation Sacramento. The installation is seamless and the peace of mind is priceless for our clients in Sacramento. Gutter Guard comes in different materials & styles just like a gutter. When picking gutter guards the cheap gutter guards often don't work while some of the expensive ones provide no benefit. When the time comes for your family to clean their gutters the best option is to purchase a gutter guard system that will protect the gutters & actually, provide the peace of mind you are looking for in Sacramento. With the massive quality of leaves in Sacramento it is often overlooked until the system fails to work. Why Get Gutter Guard Sacramento? Why get Gutter Guard in Sacramento? The gutter is an important part of the house as it helps you to maintain the cleanliness and safely discharge dirty water. Gutters can be very messy, stinky and miserable when it comes to cleaning. It is one of the pathetic tasks which can give a headache to anyone. To overcome this problem, and to make it easier for people to clean their gutters regularly, it is advisable to hire a professional Sacramento Gutter Guard company. Rain Gutter Guard Sacramento is basically a mesh barrier which prevents debris, leaves and other trash materials from blocking the gutter. Professional Gutter Guard Installation Sacramento by the best Sacramento Gutter Guard Company is needed in order to make the job trouble-free. Regular maintenance and inspection of the gutter by Gutter Guards Company Sacramento is important to prevent the gutter from getting blocked with trash materials as well as to prevent disease which is caused because of dirty water. Installation of Rain Gutter Guard Sacramento is worth the effort, money and time as it saves you from the nasty job. There are various types of Gutter Guard Sacramento CA available with the Gutter Guard Company Sacramento. 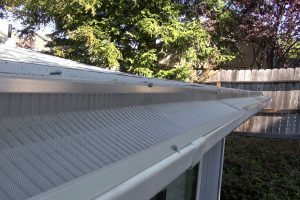 The screen is the most common type of Gutter Guard Sacramento CA which is used by people. It can be installed without any hassle as it does not involve fastening or any complex job. It is a mesh Sacramento Gutter guard screen which needs to be placed between the two layers of shingles. However, it has big openings which cannot block pine needles and seeds. This type of Sacramento Gutter guard has a very low Gutter Installation Cost in Sacramento and is readily available in different materials. Surface tension is another type of Sacramento gutter guard which gives you a considerable amount of benefit. It is designed in the way which makes the slope of the roof and the guard similar. 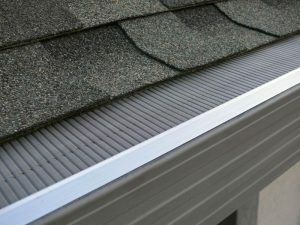 If installed correctly, then little Gutter Guard Services Sacramento CA is needed to keep it clean. Fine mesh has small openings which prevent debris, leaves and other materials from entering into the gutter. It needs Professional Gutter Guard Installation Sacramento to fasten it. It can be easily cleaned with a brush and needs occasional Gutter Guard Services Sacramento CA. We, Monster Gutter, can emphasize much on the importance of the Sacramento Gutter Guard. A Professional Gutter Guard Installation Sacramento is very essential if you do not want the gutter to get clogged with leaves, debris, and other dirt particles. It prevents the trash particles from letting in, making it easier for you to clean it regularly. Without Best Gutter guard Sacramento, dirty water can easily damage your landscape and the appearance of your house. The substructures are prone to rot and mold growth, without a Sacramento Rain Gutter Guard. We, Monster Gutter, the Sacramento Gutter Guard Company provides you with the Best Gutter guard Sacramento which is capable of preventing even the smallest dirt particles from getting into the gutter. You can prevent serious damage to the house by opting for Sacramento Gutter Guard Installation by us. Monster Gutter, a reputed Gutter Guard Company Sacramento, offers you different kinds of Sacramento Rain Gutter Guard to suit your needs. The design of the Best Gutter guard Sacramento is really very flexible, which can be fitted in any house. If you are tired of climbing the ladders and cleaning the messy gutter every time, we have leaf filter for you. Leaf filter is the solution for water damage caused due to the backed up water in the gutter. Sacramento Rain Gutter Guard offered by our company, the best Sacramento Gutter Guard Company is capable of providing effective drainage for up to 10’’ of rainfall per hour. Our gutter guard protection can be installed easily without any replacement needed. The gutter guard from our company, Monsters Gutter, prevents any icicle build up on the roof line. Our gutter guard is long lasting and corrosion resistant as it is made from heavy-gauge steel or aluminum. It retains its shape even after exposure to intense climate change. If you need our Sacramento Guard Services, then you can call us at our office number. We will make sure that your problem is solved with our Gutter Guard Services Sacramento CA as customer satisfaction is what we believe in. The Sacramento Gutter Installation Costs offered by us are very reasonable considering its high quality. Still, we offer financing options to help our customers. We offer a lifetime warranty on certain parts of the product and also no-clog guarantee. Remember that if you do not properly displace the rainfall that we receive yearly. Water will begin to rot out your rafter tails which then leads to further complications with the roof. And as the water overflows in sheets from your clogged gutter system that water will slowly start to erode at your foundation. Which at first will not cause any major damage, but if the problem persists, you will find your self with a bill that will far outweigh the cost of properly maintaining your rain gutter system. Even though gutter guard installation Sacramento don't provide a "for sure" protection against all the debris that can get into and clog your gutters and downspouts. They are most popular for reducing the number of times that you have to have someone come out and clean them. If you are reading this then you know or at least are thinking that gutter guards will be a good investment for your home or business. Call today for an estimate on gutter guard installation Sacramento home. What Type of Gutter Guard Installation in Sacramento is Best for Your Home? Below we will list the 6 types of gutter guards are and how they function. Please keep in mind that while these systems can be installed by you. We recommend having your gutter guard installation Sacramento be performed by a professional with the proper tools and materials to get the job done correctly. These gutter guards feature strips with 100 of tiny holes that cover the gutter system and attach to the roof. These small holes by filtering out the leaves and debris, while still letting water to fall into the gutter system and flow through your downspouts without interference. These gutter guards consist of bristles that direct leaves and debris to stay on top so that the water can flow ly into the gutter system and downspouts. They look very much like the "bristles" that prevent birds from perching in unwanted places. 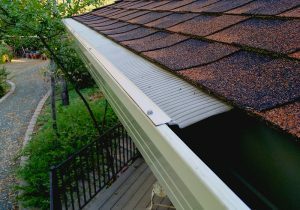 These gutter are popular for locations where they have harsh winters. They are designed to prevent snow and ice from gathering in the gutter. They are designed to fit into your gutter system without having to attach to the shingles. These Rain Gutter covers are designed to actually replace your current rain gutter system. They are made up of thin angled slats that will divert the rain from the roof. These foam gutter guards are fitted to sit inside of your rain gutters. They are made of foam if you hadn't guessed and allows for water to flow through the foam will keep most all debris from getting into the gutter its self. By having a gutter guard installation in Sacramento, you can save thousands of dollars over the years. And ensure that your gutter system is doing what it was designed to do. And that's to protect your most important assets from elements that can weather away at your foundation and structural integrity. Whichever gutter guard installation you choose, it will keep debris from getting into your gutters and are guaranteed to keep your gutters from overflowing due to clogs. We carry a wide variety of gutter guard systems to ensure the right fit. Whether your just looking for a simple and cost-effective gutter guard installation Sacramento or you are looking for the most elaborate system available we have the gutter guards for you. Just like when you are searching for any other contracting service. When you are looking for a gutter guard installation Sacramento be sure that you find a licensed contractor. Any old Joe can say that they are a professional with gutter guard Sacramento installations, but if they haven't taken the steps and gone through the proper and legal process of getting licensed insured and bonded. How can you trust that they will provide quality service and get your gutter guard installation Sacramento done without damaging your home? We pride ourselves on customer service have dedicated ourselves to your satisfaction. Let our gutter guard installation Sacramento crew come out and give you an estimate today. Our crew is comprised of highly experienced and trained technicians. They will be able to answer any questions that you have about a rain gutter guard Sacramento installation. We have the experience and know how to help you through the decision making process.